Everyone who owns property should be aware that asphalt pavement often needs to be reinforced. 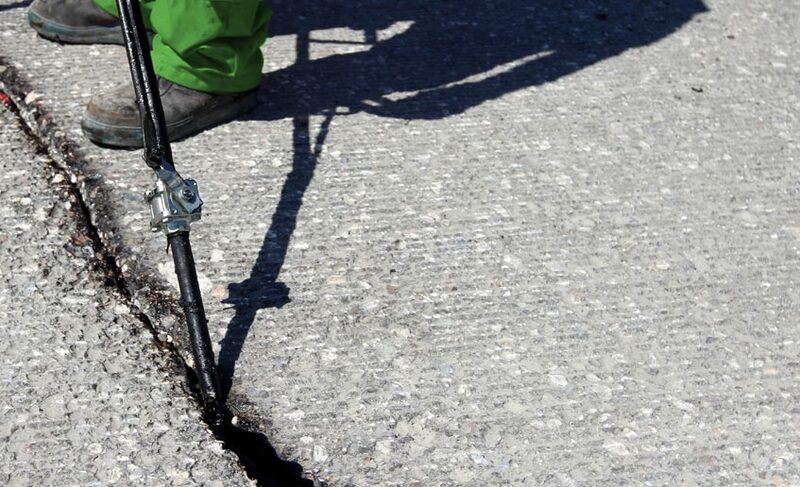 One of the best ways to provide reinforcement and prevent damage is with pavement crack filling services. This procedure involves the application of hot rubberized sealant to the cracks along the asphalt. Fill these gaps and your property will be protected against water exposure along the pavement interior, sub-grade and stone base. Property owners are constantly on the prowl for a low-cost way to maintain pavement. Crack filling is the perfect solution. It’s affordable, guards against problematic cracks and prevents water from compromising the pavement’s integrity. Lean on PLS for your crack filling and you’ll find that it prevents the creation of an unstable base. Such instability can result in nasty cracks and even a total pavement failure. Crack filling is also helpful in the prevention of potholes that form due to the presence of cracks in uneven areas with high traffic. When are pavement crack filling services necessary? It’s prudent to perform crack filling throughout the entirety of the pavement’s life cycle. You can trust PLS to only fill the gaps that actually require sealant (as opposed to alligatored spaces). At what frequency should pavement crack filling services be performed? The average Tampa Bay business will require pavement crack filling services to be performed at least once per year. It’s prudent to budget for this cost when crafting your annual manual maintenance and repair plan. Does it take a long time for crack filling to dry? Though crack filling is conducted at 300 degrees Fahrenheit, it cools in a relatively short period of time. Tracking will not be an issue due to the presence of crack filler and black silica sand. Why isn’t crack filling performed on alligatored areas? Parking lots with alligatored areas likely have water exposure at the sub-grade layer. This is a sign that the pavement is not in the proper condition to support the weight of existing vehicles that traverse the surface. As a result, it’s not prudent to perform crack filling. Is it possible for the sealcoat material and crack sealing material to stick together? These substances will probably stick to one another. Yet the crack sealing material will remain flexible regardless of the temperature. It’s highly likely that the sealer and crack seal will end up as two different colors. So don’t panic if this occurs on your property! What is the definition of “over banding”? This term refers to situations in which the crack filling material is applied to the surface of the prepared crack. As a result, the band stretches a couple of inches.